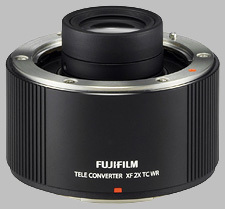 (From company literature) The "FUJINON TELECONVERTER XF2X TC WR" is a high-performance teleconverter capable of multiplying the focal length of mounted lenses* by two. It features excellent optical design with a construction of 9 elements in 5 groups to maintain the optical performance of the original lens. Also, thanks to the unified design when mounted to a compatible lens, the teleconverter is weather and dust-resistant and operates at temperatures as low as -10°C. This makes it possible to be used with confidence outdoors when used with the weather and dust-resistant camera body, and lens. The Fujinon XF 2X TC WR doesn't have any user reviews yet!